Radiography is the mainstay in idiopathic scoliosis imaging to both confirm the diagnosis and rule out any underlying conditions. Scoliosis is the presence of one or more lateral rotatory curves of the spine in the coronal plane. Although defined as a side-to-side deformity, it is a 3-dimensional (3D) rotational deformity. Many causes of scoliosis are known; however, 80% of them are idiopathic. Idiopathic scoliosis is a diagnosis of exclusion. Most cases of scoliosis are managed conservatively, but surgery is required in select cases to arrest further progression of the deformity, to correct the curve, and to manage severe pain. Imaging plays a crucial role in confirming the diagnosis, determining the cause, grading the severity of the curve, assessing maturity, identifying patients who need surgery, and assessing postoperative complications. Indications for radiography include alterations in normal spinal alignment on physical examination or detected on other imiaging studies, evaluation of spinal curvature progression, follow-up of treatment, and evaluation of individuals at risk for scoliosis. For a scoliosis survey, the preferred method is a posteroanterior radiograph with the patient in the upright position. For patients who are being assessed or are being clinically treated for scoliosis, other images include right and left lateral bending images, hyperextension and hyperflexion upright views to determine the flexibility of kyphosis and lordosis, respectively, and a posteroanterior image of the wrist and the hand for bone age. Radiographic analysis should identify the presence and number of curves, curve pattern, location, curve length and measurement, and vertebral rotation. Additional measurements may be obtained in special cases, such as the rib-vertebral angle in infantile idiopathic scoliosis. Skeletal maturity determination is important because mild to moderate scoliotic curves do not progress after cessation of growth. Radiography is the mainstay in assessment of scoliosis (see the images below). It is used to confirm the clinical diagnosis of scoliosis, to exclude underlying causes (eg, segmentation abnormalities), to assess the curves and their severity, to monitor progression, to assess skeletal maturity, and to determine a patient's suitability for surgery. This study is also useful in diagnosing postoperative complications and in follow-up. Plain radiograph illustrates the common terms used in describing the scoliotic curve. The upper and lower end vertebrae and apical vertebra are illustrated. The vertebrae and disk spaces are smaller on the concave side and larger on the convex side. The spinous process is rotated towards the concave side. The ribs are crowded on the concave side. Radiograph shows various grades of vertebral rotation in the spine. The pedicles are normal in the bottom vertebra, but they are moving toward the center in the upper vertebra. The spinous process is in midline in the bottom vertebra, and it is displaced in the upper vertebrae. Bone scans are useful to evaluate cases of painful scoliosis and to identify tumors or infections (see the image below). They are more sensitive than plain radiography. 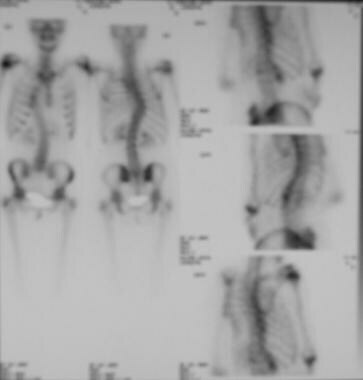 Bone scans in a patient with painful atypical scoliosis are normal. CT scanning with sagittal and coronal reconstructions can provide all the information that a plain radiograph provides (see the images below). With CT, 3D reconstructions are useful in assessing segmentation abnormalities. CT can also be used to assess the true extent of rotation and rib deformities. It plays an important role in evaluating postoperative complications. Coronal reconstructions from multidetector-row CT show several hemivertebrae. 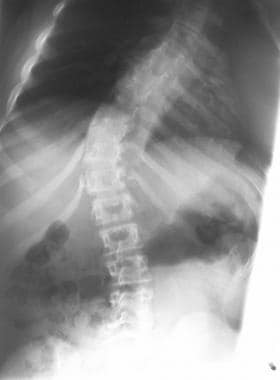 Idiopathic scoliosis is diagnosed only after underlying structural conditions such as these are excluded. 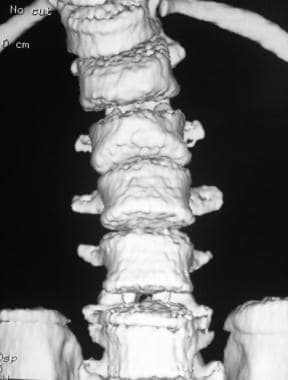 3-dimensional (3D) reconstructed CT scan of the same patient as in the previous image shows the hemivertebrae. Sagittal MRIs show lumbar scoliosis. The main limitation of radiography is the radiation dose. The risk of carcinogenesis is increased because of the repeated examinations done to monitor curve progression. This risk can be reduced with the judicious use of radiography and proper protection techniques. Radiography is less sensitive than bone scanning and MRI because tumors or infections are apparent only after 50% of the bone is destroyed. Radiographs cannot be used to assess abnormalities of the spinal cord. CT scanning is not routinely indicated, but it is a good method for assessing rotation and segmentation abnormalities. Radiography can provide all of the information needed. MRI is not cost-effective, and it is not a good screening tool because its yield in depicting important clinical abnormalities that change management is minimal. 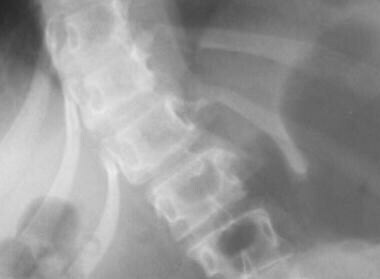 Anteroposterior (AP) radiograph shows mild adolescent scoliosis. Lateral view of mild adolescent scoliosis. Right lateral bending view of a patient with scoliosis. Left lateral bending of the same patient as in the previous image shows persistence of the scoliotic curve, which indicates its structural nature. In a healthy person, a straight line can be drawn through the cervicothoracic, dorsolumbar, and lumbosacral junctions. The degree of deviation in the cervicothoracic angle from the sacral center is measured. Hypokyphosis of less than 20° or lordosis is present. 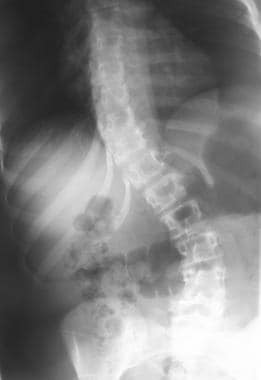 The normal thoracic kyphosis is 20-45°. The apical vertebrae show increased height in the anterior aspect of vertebral body and decreased height in the posterior aspect. Vertebral bodies and intervertebral disk spaces are wider on the convex side than on the concave side. The posterior ribs are pushed posteriorly on the convex side, where they produce a hump. They are positioned anteriorly on the concave side. The ribs are closely approximated on the concave side and separated on the convex side. At the end of the curve, the disk spaces are equal or widened on the concave side. The vertebrae and neural arches are thick on the concave side. The spinous process is shifted toward the concave side, and the pedicle and vertebral body are shifted toward the convex side. 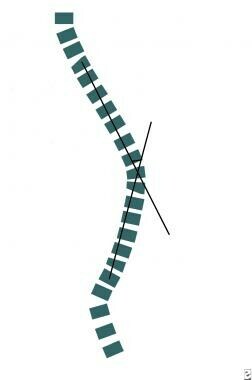 The rotation is marked at the apex of the curve and almost neutral at the end vertebrae. Rotation can be intersegmental (between vertebrae) or intrasegmental (between elements of one vertebra); the latter is uncorrectable. The psoas shadow is absent on the concave side of the curve. Many classification systems are used to describe the types of scoliotic curves. Classification helps surgeons determine appropriate management, because prognosis and treatment of the various curves differ. Type I is a single major lumbar curve at T11-L3 with an apex at L1-2 (this is the most benign type and affects 23% of patients). Type II is a single major dorsolumbar curve at T6-7 to L1-2 with an apex at T11-12 (16%). 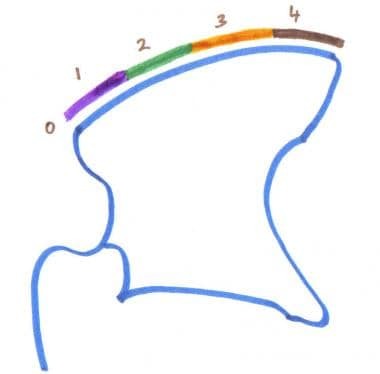 Type III is combined thoracic and lumbar (37%) with a dorsal curve on the right side at T5-6 or T10-11 and an apex at T7-8 and a lumbar curve on the left side at T10-11 to L3-4 with an apex at L1-2. Type IV is a single major thoracic curve at T5-6 to T11-12 with an apex at T8-9 (22%). Type V is cervicothoracic at C7-T1 or T4-5 with an apex at T3. Type I is lumbar dominant and S shaped (10%). Type II is thoracic dominant and S shaped (33%). Type III is thoracic where the thoracic and lumbar curves do not cross the midline (33%). The Lenke classification has 3 components: type of curve; lumbar modifier; and sagittal thoracic modifier. Type of curves are as follows: I, primary thoracic; II, double thoracic scoliosis; III, double major scoliosis; IV, triple major scoliosis; and V, dorsolumbar-lumbar scoliosis. The lumbar modifier is based on the relationship of the central sacral vertical line to the apex of the lumbar curve and is classified into A, B, and C categories. Posteroanterior (PA) erect view of the entire spine from cervical to sacral spine and including the iliac crest; this view is ideally obtained with the patient's shoulders outstretched. AP recumbent view of entire spine, cervical to sacral. Lateral view of dorsolumbar spine; the patient's forearm must be kept horizontal by resting it on a stand. Lateral profile at the apex of scoliosis to eliminate kyphosis and show the true extent of the scoliosis. Stagnara image (planed election view) perpendicular to the true coronal plane of the apical vertebra. Leeds image, a true lateral view 90° perpendicular to the Stagnara view. Left and right lateral bending views; these are obtained to exclude postural scoliosis; postural scoliosis disappears when bending toward the side of convexity; these views are also used to assess structural scoliosis, asymmetry and loss of normal mobility of primary curve,  and wedging rotation of individual vertebra, as well as to dynamically assess the postural nature of secondary compensatory curves in the preoperative period and to select fusion levels. AP view of the left hand to assess bone age. Biplanar views with digital enhancement. Ferguson view perpendicular to the L5-S1 disks to detect anomalies at this junction. Coned views of focal vertebral anomalies. In routine practice, not all these views are necessary. Full-length frontal and lateral views, as well as right and lateral bending views, are enough. Common views obtained before surgery are PA and lateral image, which are obtained with long-cassette film to cover the whole spine, beginning from the craniocervical junction and including the pelvis to assess the Risser grade; supine, standing, or sitting images if patient is unable to stand; and lateral bending views to assess the extent of compensatory curves. For subsequent follow-up imaging, the frontal PA view is sufficient, and lateral views are required only if a superimposed kyphotic element is present. The apical vertebra is the vertebra that is displaced and rotated most. Its endplates are least tilted. The end vertebrae are the most superior and inferior vertebrae in the curve. These bones are least displaced and rotated, with maximal tilting of the endplates toward the concavity of the curve. They are laterally wedged, longer in the convex side, and compressed on the concave side. 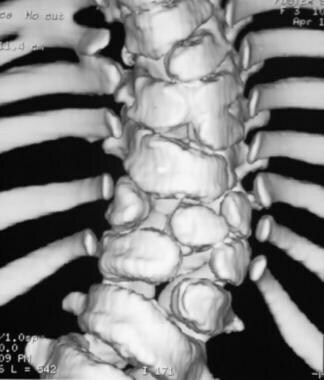 The neutral vertebra is not rotated on the anteroposterior (AP) image. The stable vertebra is bisected by the central sacral line. The primary curve is the structural curve, with wedging, angulation, rotation, and an abnormal position. The primary curve is deformed and develops structural changes simultaneously. It is not corrected spontaneously or with mechanical correction. The following characteristics are helpful in identifying the primary curve: (1) the vertebrae are deviated to the convexity of the curve; (2) if 3 curves are present, the middle one is usually the primary curve; (3) if 4 curves are present, the middle 2 are the primary ones; and (4) the primary curve may be the greatest curve. The secondary curve is the nonstructural curve that develops in response to the primary structural curve. The structural changes in this curve occur slowly. It can be corrected spontaneously, and any mechanical correction is retained. The vertebrae are displaced to the concavity of the curve. The compensatory curves are curves formed to balance the primary curve. If a primary curve is formed in 1 direction, another curve of same magnitude should be formed in the opposite direction to fully compensate for the deformity. For example, if the primary curve is 50°, 1 or 2 compensatory curves may be present and add to equal 50° in the opposite direction. A decompensated curve is a compensatory curve that does not fully correct the deformity. An example is a 40° compensatory curve for a 50° primary curve results in decompensation. An overcompensated curve is a compensatory curve that is more than the primary curve. An example is a 60° compensatory curve or a combination of curves adding to 60° that overcompensates for a 50° primary curve. There are a number of techniques, measures, and indices to assess scoliosis, including the Cobb-Webb technique, Lippman-Cobb technique, Ferguson technique, Greenspan method, Nash-Moe technique of measuring vertebral rotation, Cobb method of assessing vertebral rotation, and the Risser index. This is the most commonly used technique to measure the severity of scoliosis. The result determines further management and helps predict the prognosis. The superior and inferior end vertebrae of the scoliotic curve are identified by carefully observing the rotation of vertebral bodies and the width of the intervertebral space. The intervertebral space is almost normal, and the vertebrae are in neutral position without substantial rotation in the superior and inferior end vertebra. Lines are drawn tangential to superior endplate of the superior end vertebra and the inferior endplate of the inferior vertebra. The Cobb-Webb angle is the angle formed at the intersection of these lines or the angle formed at the intersection of the lines perpendicular to these lines. 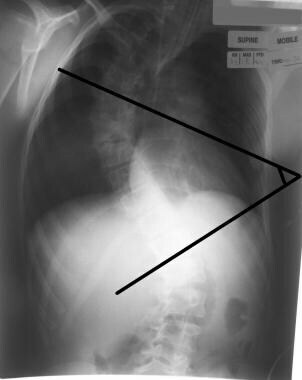 A Cobb angle of at least 10° is essential for diagnosing scoliosis. A 10° measurement difference should be present to be 95% confident that the curve is progressing. Line diagram illustrates measurement of the Lippman-Cobb angle. Radiograph shows measurement of Lippman-Cobb angle. A line is drawn from the center of the apical vertebra to the center of the superior end vertebra. Another line is drawn from the center of the apical vertebra to the center of the inferior end vertebra (see the images below). Line diagram shows the Risser-Ferguson technique. Radiograph shows measurement by using the Ferguson technique. The angle between these lines is used to assess the severity of the deformity. This technique provides a measurement of the scoliotic curve more comprehensive than that obtained with other methods (see the images below). The midpoint of the vertebra above the upper end vertebra and the midpoint of the vertebra below the lower end vertebra are joined to form a vertical spinal line. Lines are drawn from the center of each vertebra in the scoliotic curve to the vertical spinal line. The value of these individual lines are added and divided by the length of the vertical spinal line. A correction factor is added for magnification. Line diagram illustrates the Greenspan technique. 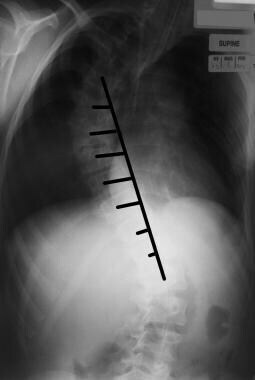 Radiograph shows measurement of the Greenspan index of scoliosis. In a healthy person, the value is zero. This method is superior to the Lippman-Cobb technique because it allows the clinician to measure the deviation at each individual vertebral level. This technique is also valuable in measuring short-segment or small curvatures. This is a measure of rotational deformity of the vertebra. Line diagram shows the Nash-Moe method of measuring vertebral rotation. On frontal images, the vertebra is divided into 6 segments, and the rotation is quantified on the basis of where the pedicle is located. The pedicles are normally situated in the outer segments. 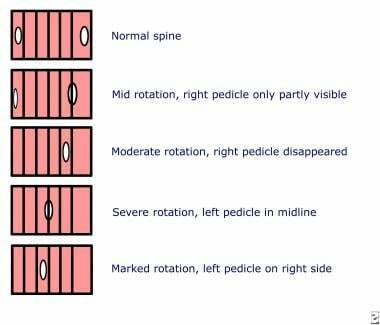 The rotation is graded according to the extent of migration of the pedicle toward the convex side of the curve. 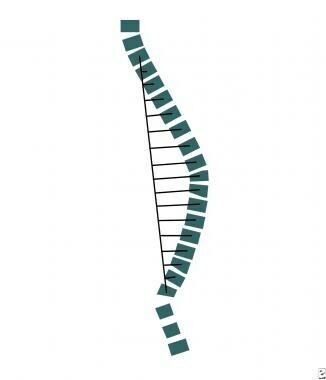 The Cobb technique uses the position of spinous process for assessing the degree of vertebral rotation. The vertebra is divided into 6 equal segments by drawing 5 vertical lines (see the image below). 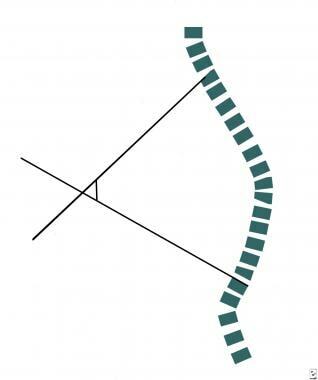 Line diagram illustrates the Cobb method of measuring vertebral rotation. The spinous process is normally situated in the midpart of the vertebra overlying the third line. With increasing rotation, the spinous process is rotated toward the convex side of the curve. Grade I is ossification of the lateral 25% of the iliac apophysis. Grade II is ossification of the lateral 50%. Grade III is ossification of the lateral 75% of the apophysis. Grade IV is ossification of the entire apophysis. Grade V is fusion of ossified epiphysis to the iliac wing. Line diagram illustrates the Risser index. Scoliotic curves usually progress during periods of rapid growth, such as infancy and adolescence, and they stop growing after spinal maturation is complete. Spinal growth is completed at approximately 15 years 3 months of age in female adolescents and 15 years 10 months of age in male adolescents. This maturation coincides with the completion of ossification in the iliac apophysis, which begins at around 15 years in male adolescents and around 14 years in female adolescents. The whole process of ossification from stage I to stage IV requires 12-18 months. After ossification, the apophysis fuses with iliac crests in 2 years in girls and slightly faster than this in boys. Progression usually does not happen after grade IV maturity of iliac apophysis is achieved. If the curve is 50-80° at the time of maturity, it tends to progress even after the apophysis fuses, especially if the curve is in the thoracic and lumbar region. However, this progression is far slower than the progression that occurs during adolescence. Ossification starts earlier than previous thought; hence, this index is not reliable. The index is less reliable in male patients than in female patients because their ossification starts early; in male patients, growth should be considered completed when a Risser index of only 5 is achieved. Recent data indicate that this index is not an accurate measure of completed maturity, spinal growth, or progression of the deformity. This is an alternative method for assessing skeletal maturity (see the image below). Vertebral apophysis maturation. Left image shows the ossification center. Ossification is complete in the middle image. Right image shows fusion indicating vertebral maturation. 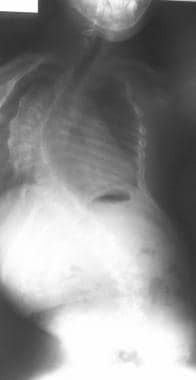 Before skeletal maturity, the vertebral ring apophysis is absent, or it is incompletely formed or completely formed without fusing to the body. After skeletal maturity, the vertebral ring apophysis fuses to the body. This occurs by age 16 years in female adolescents and age 19 years in men. This parameter is useful in predicting the progression of the curve in the idiopathic infantile type of scoliosis (see the images below). Line diagram shows rib–vertebral angle difference (RVAD) (Mehta, 1976). Radiograph shows measurement of difference in the rib-vertebral angle. A line is drawn along the inferior border of the apical vertebra, and another line is drawn perpendicular to the first. The midpoints of the head and neck of ribs on either side of the apical vertebra are connected by lines. These lines are extended to meet the perpendicular line drawn initially, and the angles they make are called rib-vertebral angles. In thoracic curves, the angle is usually smaller on the convex side than the concave side because of the greater obliquity of the ribs on the convex side. In combined thoracic and lumbar curves, the angle is low at the level of the apical thoracic vertebra and can be greater on the convex side. This curve can be further negative because of the associated drooped 12th rib on the concave side of the curve. In resolving curves, the angle is less than 20°, and it is more than 20° in progressive curves. Subsequent images obtained after 2-3 months show a decreased angle in resolving curves and the same or increased angle in progressive curves. 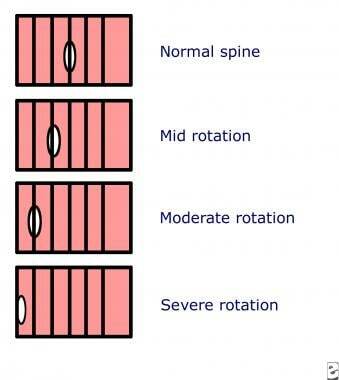 The Perdriolle method is used to measure apical vertebral rotation. The Lytilt method is used to measure the angle between the L4 vertebra and a line connecting the iliac crests. Ossification and maturation of the epiphysis of the left hand and wrist are compared with standards. Two main methods are used. The first is the Greulich-Pyle method, in which the radiograph of the hand and wrist is compared with standard radiographs in the atlas. The second is the Tanner-Whitehouse method, in which the epiphyses of the hand and wrist are compared with those of the atlas. A score is assigned to each of them, and the sum is compared with values on standard tables. Thus, bone age is assessed. 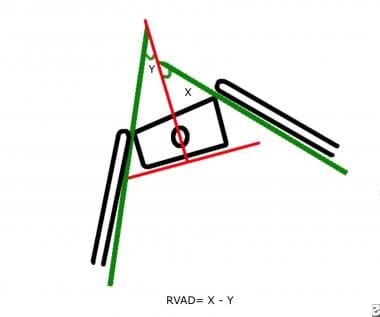 The Cobb angle based on an anteroposterior radiograph is a necessary prerequisite to plan the surgery, and corrective surgery is always required when a Cobb angle is greater than 50 degrees. The immediate preoperative assessment should include chest radiographs for cardiovascular assessment, supine and recumbent AP views of the spine, right and left lateral bending images, and traction views. The bending and traction views are helpful in assessing the site of fusion, the degree of correction required, and the placement of spinal devices. Two Harrington or Luque rods can be used to accomplish segmental stabilization at each level of the spine using sublaminar wires. Use of the Cotrel-Dubousset system with multiple hooks with rods may improve 3D results. An anterior approach can be used with thoracotomy or thoracoscopy in which single or double rods with screws are attached to each vertebral body; results are better than with other methods, and this approach treats the rib bump at the same time. Recognized complications are damage to the rods or wires, dislocation or migration of the rods, loosening of a device, spondylolysis, pseudoarthrosis, aortic aneurysm, retroperitoneal fibrosis, gastric volvulus, and progression of the deformity (crankshaft phenomenon). This last complication occurs when surgery is performed before maturity (Risser index < 1 and age < 10 y). The unfused vertebrae and portions of the vertebrae not included in the fusion continue to grow, producing progressive deformity. This effect is marked in posterior fusion, in which the anterior portions of vertebrae continue to grow and produce a new curve. Follow-up assessment should be routinely performed until the patient reaches maturity. The scoliotic deformity can be visualized on CT scans of the thorax and abdomen (see the images below). Associated lesions, such as osteoid osteoma, osteoblastoma, infection, tumors, disk prolapse, and costovertebral dislocation, can be found. 3-dimensional (3D) reconstruction of mild scoliotic curve without segmentation anomaly. CT is good for assessing rotation of the vertebra. CT scan illustrates the indices useful for assessing the extent of rotation. With modern multidetector-row CT scanners, thin sections of the whole body can be obtained within a few seconds and reconstructed in any plane: sagittal, coronal, oblique, or axial. Even 3D reconstruction with shaded-surface display or volume rendering is possible. 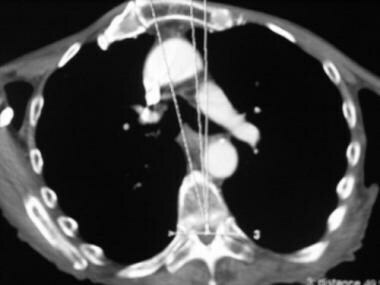 CT myelography is not routinely done, and it is not needed in idiopathic scoliosis. This is useful for evaluating intraspinal lesions, such as diastematomyelia, a tethered cord, or intraspinal tumors. Compression of the spinal cord can also be assessed. CT is performed for an evaluation of segmentation abnormalities with 3D reconstructions, though MRIs have largely replaced these scans. CT is also used to evaluate postoperative complications because MRIs may show metallic artifacts. In addition, CT helps in evaluating intrinsic rotational deformity. Scoliotic deformity can be visualized on CT scans of the thorax and abdomen. Associated lesions, such as osteoid osteoma, osteoblastoma, infection, tumors, disk prolapse, and costovertebral dislocation, can be found. Finally, associated rib-cage deformity is best assessed with CT scans. The rib-cage deformity is well correlated with the longitudinal deformity at the level of the apical vertebra. CT myelography is done to assess suspected radiculopathy, intraspinal lesions, or cord compression. The apical vertebra of the primary curve is identified by using plain radiography. CT scans are then acquired at this level to help assess the longitudinal deformity. Several lines are used. Line 1 is drawn from the center of the posterior aspect of the vertebral foramen to the center of the vertebral body and extended to the anterior chest wall. Line 2 extends from the center of the posterior aspect of vertebral foramen to the anterior midline of the body. Line 3 is a horizontal line extending through the center of the posterior aspect of the vertebral foramen. A perpendicular is then drawn from the center of the posterior aspect of the vertebral foramen to meet the anterior chest wall (see the images below). Line diagram illustrates measurement of the CT index. Line diagram illustrates measurement of the CT rib-hump index. 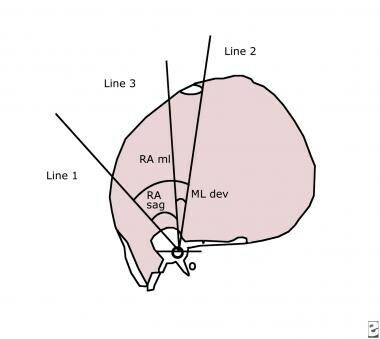 The rotation of apical vertebra from the anterior midline of the body (RAML) is the angle between line 1 and line 2. The rotation of the apical vertebra from the sagittal plane (RASag) is the angle between line 1 and line 3. This is the most definitive method for assessing the severity of scoliosis with CT scans. The results are significantly correlated with the Cobb-Webb angles on plain radiographs. The angle of lateral deviation of the apical vertebra from the midline of body (Mldev) is the angle between line 2 and line 3. RAML is the sum of RASag and Mldev. The rib-hump index is measured at the level of the rib hump by using several lines. Line 1 is a horizontal line drawn through the center of the posterior aspect of the vertebral foramen to the lateral chest wall on both sides. Line 2 is a horizontal line parallel to the first; this line passes through the peak of the inner rib cage on the hump side. Line 3 is parallel to the first and passes through the peak of the inner rib cage on the side opposite the hump. Line 4 is a perpendicular line drawn from the peak of the inner rib cage on the hump side to meet the first line at point 0. 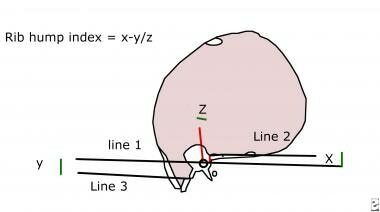 The rib-hump index is defined as (X - Y)/Z, where X is the distance between line 1 and line 2, Y is the distance between lines 1 and 3, and Z is the distance between point 0 and the center of posterior aspect of the vertebral foramen. The rib-hump index is directly correlated with RASag. Postoperative CT scanning can be done to assess for the development of complications such as hemorrhage, fracture, or pseudoarthrosis. MRI is performed in the sagittal, axial, and coronal planes by using T1- and T2-weighted sequences. Proper technique is difficult, especially if the patient has more than one curve. MRI is indicated if the patient develops neurologic deficits after the procedure. If MRI is being done for the first time, occult spinal cord lesions cannot be detected. Imaging might be difficult because of the presence of spinal instruments. Hemorrhage, pseudoarthrosis, and tumors can be detected. Axial MRI shows apical vertebra. 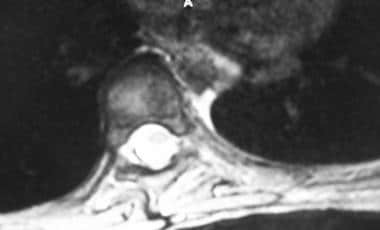 Sagittal MRI shows an Arnold-Chiari I malformation and syringomyelia. Idiopathic scoliosis is diagnosed only after its differential diagnoses are excluded. In one study, 50% of all cases previously designated as being idiopathic involved some spinal lesion. Untreated syringomyelia contributes to paraplegia after surgery. 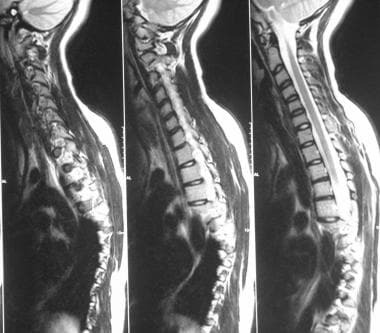 MRI is also used to investigate occult intraspinal tumors, which can occur with scoliosis but without any neurologic symptoms or signs; to exclude other underlying abnormalities, such as tumors, infections, and disk prolapse; to evaluate atypical scoliosis or an atypical curve in a child with normal neurologic findings; to evaluate the patient before surgery because assessment of the spinal cord in patients with postoperative neurologic symptoms can be difficult because surgical devices produce artifacts; to evaluate rotational deformity and distinguish intervertebral from intravertebral rotation (standard derotational surgery is suboptimal in those with predominant intravertebral rotation. ); and to ascertain the severity of the curve. Do et al found that only 7 of 327 patients with diagnosed idiopathic scoliosis had other abnormalities on routine MRI. None of the newly diagnosed pathologies were clinically important in terms of future management. Important considerations are intraspinal tumors. Intraspinal tumors occasionally cause scoliosis and no other symptoms. In such cases, idiopathic scoliosis might be diagnosed. Only MRI can depict intraspinal tumors. The identification of notable neurologic and other diseases alters management. If the patient develops neurologic symptoms postoperatively, assessment of the spinal cord is difficult because of the surgical devices, which produce artifacts. Hence, a routine preoperative MRI is considered useful. Although MRI has been advocated in patients with atypical scoliosis, data confirming the benefit of this approach are lacking. MRI can depict a number of findings; however, a recent study revealed no significant difference in the incidence of anomalies between those with atypical findings and patients without atypical findings. Even if anomalies such as syringomyelia and Chiari malformation are found, they do not affect management. Therefore, the effectiveness of MRI as a diagnostic tool is questioned. Some centers still routinely use MRI, and others use it only if surgery is contemplated or if atypical signs are present. 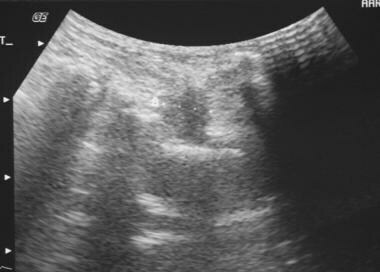 Sonogram shows a small collection adjacent to the rib, which was drained. Bone scanning is not routinely performed in idiopathic scoliosis. Bone scans are obtained to evaluate atypical or painful scoliosis and to exclude infection. Focal hot spots can be seen in osteoid osteomas, osteoblastomas, infections, and other primary tumors that can cause painful scoliosis. Bone scans may also help assess surgical complications, including infection. 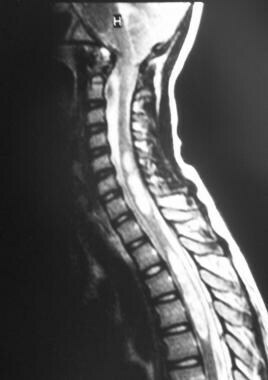 A WBC scan may be required to differentiate infection from postoperative changes in the spine. Focal hot spots are also seen in stress fractures, spondylosis, and pseudoarthrosis in the fused segments. Bone scanning is highly sensitive in the diagnosis of bone lesions. Osteoid osteoma is the most common cause of painful scoliosis. Bone scanning is helpful in assessing this condition and for showing increased uptake. [Guideline] American College of Radiology. ACR–SPR–SSR PRACTICE PARAMETER FOR THE PERFORMANCE OF RADIOGRAPHY FOR SCOLIOSIS IN CHILDREN. acr.org. Available at http://www.acr.org/~/media/ACR/Documents/PGTS/guidelines/Scoliosis.pdf. 2014; Accessed: August 10, 2018. [Guideline] Horne JP, Flannery R, Usman S. Adolescent idiopathic scoliosis: diagnosis and management. Am Fam Physician. 2014 Feb 1. 89 (3):193-8. [Medline]. [Full Text]. Coonrad RW, Murrell GA, Motley G, et al. A logical coronal pattern classification of 2,000 consecutive idiopathic scoliosis cases based on the scoliosis research society-defined apical vertebra. Spine. 1998 Jun 15. 23(12):1380-91. [Medline]. Do T, Fras C, Burke S, et al. Clinical value of routine preoperative magnetic resonance imaging in adolescent idiopathic scoliosis. A prospective study of three hundred and twenty-seven patients. J Bone Joint Surg Am. 2001 Apr. 83-A(4):577-9. [Medline]. Ameri E, Andalib A, Tari HV, Ghandhari H. The Role of Routine Preoperative Magnetic Resonance Imaging in Idiopathic Scoliosis: A Ten Years Review. Asian Spine J. 2015 Aug. 9 (4):511-6. [Medline]. Shi B, Mao S, Wang Z, Lam TP, Yu FW, Ng BK, et al. 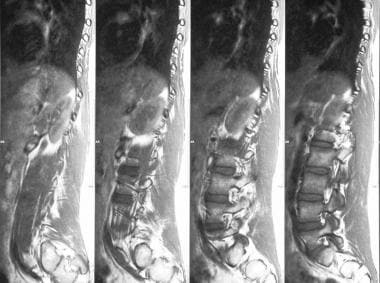 How Does the Supine MRI Correlate With Standing Radiographs of Different Curve Severity in Adolescent Idiopathic Scoliosis?. Spine (Phila Pa 1976). 2015 Aug 1. 40 (15):1206-12. [Medline]. Hesarikia H, Azma K, Kousari A, Nikouei F. Magnetic resonance imaging investigations of position of conus medullaris in adolescent idiopathic scoliosis as a peripheral neuropathy. Int J Clin Exp Med. 2015. 8 (4):5918-24. [Medline]. Cassar-Pullicino VN, Eisenstein SM. Imaging in scoliosis: what, why and how?. Clin Radiol. 2002 Jul. 57(7):543-62. [Medline]. Oestreich AE, Young LW, Young Poussaint T. Scoliosis circa 2000: radiologic imaging perspective. I. Diagnosis and pretreatment evaluation. Skeletal Radiol. 1998 Nov. 27(11):591-605. Gu SX, Wang CF, Zhao YC, Zhu XD, Li M. Abnormal ossification as a cause the progression of adolescent idiopathic scoliosis. Med Hypotheses. 2009 Jan 10. [Medline]. Driscoll M, Aubin CE, Moreau A, Villemure I, Parent S. The role of spinal concave-convex biases in the progression of idiopathic scoliosis. Eur Spine J. 2009 Feb. 18(2):180-7. [Medline]. Kao FC, Lai PL, Chang CH, Tsai TT, Fu TS, Niu CC, et al. Influence of lumbar curvature and rotation on forward flexibility in idiopathic scoliosis. Biomed J. 2014 Mar-Apr. 37 (2):78-83. [Medline]. Aaro S, Dahlborn M. The longitudinal axis rotation of the apical vertebra, the vertebral, spinal, and rib cage deformity in idiopathic scoliosis studied by computer tomography. Spine. 1981 Nov-Dec. 6(6):567-72. [Medline]. [Guideline] Negrini S, Donzelli S, Aulisa AG, Czaprowski D, Schreiber S, de Mauroy JC, et al. 2016 SOSORT guidelines: orthopaedic and rehabilitation treatment of idiopathic scoliosis during growth. Scoliosis Spinal Disord. 2018. 13:3. [Medline]. [Full Text]. Richards BS, Sucato DJ, Konigsberg DE, Ouellet JA. Comparison of reliability between the Lenke and King classification systems for adolescent idiopathic scoliosis using radiographs that were not premeasured. Spine. 2003 Jun 1. 28(11):1148-56; discussion 1156-7. [Medline]. Lenke LG, Betz RR, Harms J, et al. Adolescent idiopathic scoliosis: a new classification to determine extent of spinal arthrodesis. J Bone Joint Surg Am. 2001 Aug. 83-A(8):1169-81. [Medline]. Sangole AP, Aubin CE, Labelle H, Stokes IA, Lenke LG, Jackson R, et al. Three-dimensional classification of thoracic scoliotic curves. Spine. 2009 Jan 1. 34(1):91-9. [Medline]. Cobb JR. The problem of the primary curve. Am J Orthop. 1960 Dec. 42-A:1413-25. [Medline]. Zhao J, Fan J, Shen H, Yang C, Chen Y, Li M. Characteristics of Cobb angle distribution in the main thoracolumbar/lumbar curve in adolescent idiopathic scoliosis: A retrospective controlled clinical study. Medicine (Baltimore). 2018 Jun. 97 (25):e11216. [Medline]. [Full Text]. Rivett L, Rothberg A, Stewart A, Berkowitz R. The relationship between quality of life and compliance to a brace protocol in adolescents with idiopathic scoliosis: a comparative study. BMC Musculoskelet Disord. 2009 Jan 14. 10:5. [Medline]. Lonner BS, Auerbach JD, Estreicher M, Milby AH, Kean KE. Video-assisted thoracoscopic spinal fusion compared with posterior spinal fusion with thoracic pedicle screws for thoracic adolescent idiopathic scoliosis. J Bone Joint Surg Am. 2009 Feb. 91(2):398-408. [Medline]. Sarlak AY, Atmaca H, Buluç L, Tosun B, Musaoglu R. Juvenile idiopathic scoliosis treated with posterior arthrodesis and segmental pedicle screw instrumentation before the age of 9 years: a 5-year follow-up. Scoliosis. 2009 Jan 6. 4(1):1. [Medline]. Smyrnis PN, Sekouris N, Papadopoulos G. Surgical assessment of the proximal thoracic curve in adolescent idiopathic scoliosis. Eur Spine J. 2009 Feb 14. [Medline]. Wang Q, Li M, Lou EH, Wong MS. Reliability and Validity Study of Clinical Ultrasound Imaging on Lateral Curvature of Adolescent Idiopathic Scoliosis. PLoS One. 2015. 10 (8):e0135264. [Medline]. Line diagram illustrates the common terms used in describing scoliosis. Intraoperative image shows screw fixation. Harrington rods with wires, hooks, and screws. 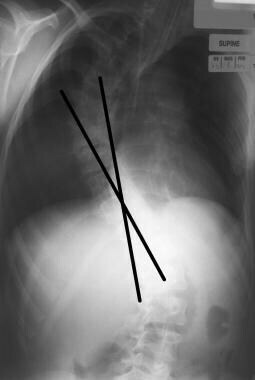 Harrington rods with wires, hooks, and screws as shown on a lateral radiograph. Anteroposterior (AP) view of fixation by using pedicle screws. Lateral view of pedicle screws. Coronal CT appearance of pedicle screws. 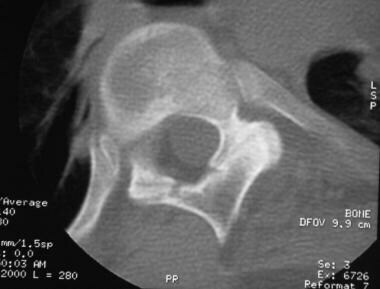 Axial CT appearance of a normal pedicular screw after surgery. Anteroposterior (AP) radiograph of body screws. Normal appearance of body screws on a lateral view. 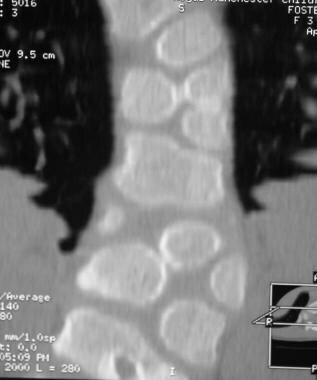 Axial CT appearance of a screw in a vertebral body. Displaced pedicular screw indenting the descending thoracic aorta. Anteriorly displaced screw in the parenchyma of the right lower lobe of the lung. Postoperative focal hot spot in the spine due to infection. CT scan shows right rib destruction and underlying pulmonary infection. 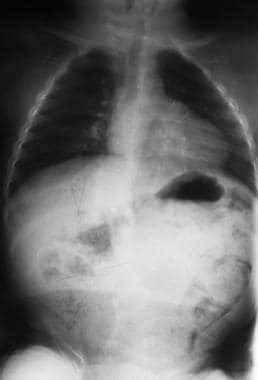 Left-sided pleural effusion is also shown. Cardiomyopathy with bilateral pleural effusion after surgery.